Analysis Shows Current Warming Is NOT Unprecedented …It Is Not Even “Unusual”! Browse: Home / 2015 / June / 24 / Analysis Shows Current Warming Is NOT Unprecedented …It Is Not Even “Unusual”! The climate calamity crowd claims that the warming we experienced in the Twentieth Century is unprecedented… it has never happened before in human history. Because we didn’t have thermometers until about 300 years ago, and even then records exist from just a few locations, it is difficult to prove that this is not so. The only reliable temperature record we have with continuous reasonable resolution data is the ice core oxygen isotope data from Greenland. I downloaded the GISP2 data and did a point-by-point difference calculation, computing the warming and cooling trend between each data point, and produced this plot. Figure 1 is a plot (blue) of the GISP2 temperature data and the calculated warming or cooling (red) between each point expressed as change (warming or cooling) per decade. The horizontal scale is in years before present. Because Excel places zero on the left side and counts up to the right, the present is on the left. Temperatures in the Holocene have been quite volatile. Excel counts in this data 73 warming periods of at least 0.1 degrees per decade, and 80 cooling periods of that same amount. The time resolution of the points in the data are from about six years to about twenty years, so many of these warming and cooling periods are short. But some span a century or longer as we will see in figure 2. I processed the HADCRUT4 data set to six year resolution to simulate the ice core data here. The highest warming was in the six year period from 1975 to 1981, a rate of 0.27°C/decade. There were two periods in the ice core data with higher warming rates, one was in 1370 BCE where in a 12 year period the warming rate was 0.357°C/decade. This period was bracketed by similar length periods with 0.25 and 0.16°C/decade warming periods. This 34-year period saw a warming of nearly a degree (0.98°C) far exceeding the warming in the late Twentieth Century. Another period 8200 years ago (6200BCE) saw a 1.667°C warming in 71 years. The people around at that time must have been truly panicked at the rapid climate change and probably blamed it on the invention of beer. Here is a chart of the ice core temperature and HADCRUT4 together as an anomaly plot using the same baseline period, spliced at 1850-55, the only years they have in common. Figure 2 is a plot of the ice core (GISP2) and HADCRUT4 as an anomaly plot. The vertical scale is in degrees C. The horizontal scale is calendar years with the present on the right. 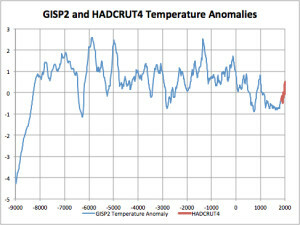 HADCRUT4 is the thermometer-measured, small, red, “Hockey-stick” at the right side. All the excitement is about half of that red uptick. The big question: Is it natural, or CO2? In Figure 2, many heating and cooling periods with high magnitude and longer duration than the current warming are seen. The two periods described above are seen at 1400BCE and 6200BCE, but there are others scattered across the plot. The current warming appears puny in comparison and only half of that is in any way attributable to CO2. Some detractors have tried to make the point that Greenland ice core data only reflects Greenland temperatures. This isn’t quite correct on several counts. Oxygen isotope fractionation acts at three places: the area of evaporation and the points of condensation and precipitation. These phenomena are latitude dependent and the evaporation area is diffuse. So the ice core data reflects temperature at Greenland’s latitude. Another point (though it only applies to the first 3000 years on this chart) is that during the Ice Age, the ice sheets removed so much fresh water from the oceans that it increased the salinity of the remainder, affecting surface oxygen isotope levels. This is also factored into the temperature calculation (link). Also, the ice core temperature data is averaged over the years represented at each section of core. This temperature represents climate over those years and not weather. The last point is that heat exchange between Greenland latitudes and the oceans, and thus the rest of the globe, insures that Greenland temperature cannot be far from reflecting global temperature. A larger point is that the current warming is not unusual. Even greater warming has occurred many times in the last 11,000 years. It has been as much as two degrees warmer than now three times in the last 10,000 years. More important, warming episodes are followed by cooling episodes that can be disastrous for mankind. The long-term trend for the last 3000 years of the Holocene has been cooling. We are slowly sliding into the next long cold at about half a degree C per millennium. The Excel spreadsheet used to generate the figures and calculations is here. If you look carefully at the graph, before about 3000 years ago (1000 or so BCE) you can see a warm period, probably Minoan. This was the time of Mycenae and Troy. And you can see the warm period was followed by a prolonged cold period. Professor Rys Carpenter gave a series of lectures on the subject of Discontinuity in Greek Civilization (Cambridge U Press, 1966) which he attributed to climate change. Several scientists have studied this historical period, including Reid Bryson. “In 1973, Bryson testified to Congress that global warming from fossil-fuel combustion was politically unstoppable. However, Brandon Drake seems to have the latest paper on the subject: The Influence of Climatic Change on the Late Bronze Age Collapse and the Greek Dark Ages, Journal of Archaeological Science, 2012. Really interesting & useful analysis. Typically temperature follows a sawtooth pattern with a steep rise and then fall. I’d have to check, but it certainly looks as if from 2000BC to the present, there’s been an overall cooling trend. And all that the latest upswing has done is take us back to the equivalent of the Roman period. Also note the way the temperature never goes above +2.5C. This is indicative of some form of strong negative feedback in the climate system. Indeed, compared to the massive rise, the temperature since has been remarkably stable and there is absolutely no indication whatsoever that the recent temperature change is in ANY WAY abnormal. The Tassili frescoes prove that people could inhabit the wet Sahara back in the Holocene Optimum (at 280 ppm CO2) Giraffes, elephants, various bovines etc. in what is now one of the most inhospitable areas. In the Eemian interglacial, roughly 125,000 years ago, there were elephants, giraffes, lions and hippos in the Thames Valley and rhinos in Yorkshire (from fossils). Supposedly at 280 ppm. CO2. So what proof is that that CO2 controls the temperature? The temperature at the latitude of Greenland has increased by a much larger margin over the last 100 years than the global mean. My apologies for not being on topic but I thought you might want to know this… on amazon dot com The Neglected Sun: How the Sun Precludes Climate Catastrophe is listed at $999.07 Canadian. Used. But you can do neither of these and keep your original message. the ice core ends before 1900. so you need the full GISS set, to splice on to the end of the ice data. If you start in 1940, you lose some of the temperature change (and it does not matter, whether this is caused by humans or not). you just need the data points. you also can not reduce the data from multiple modern thermometers to a 250 mile radius and at the same time claim, that an ice core does represent global (or at least latitude) data. so how does the graph look, if you add the full 2°C of warming? Well, sod, we know about GISS’ methods so no point in trying to convince us to believe Gavin Schmidt a word. An interesting question is, are YOU stupid enough to believe in his lies, letting him shape your worldview? Now, do you think you should base YOUR decisions on the silly claptrap from the warmunist propaganda mills? In that case, start your Pomegranate plantation in Northern Germany NOW! And good luck! Nobody needs GISS, except alarmistas, to use it keep the propaganda lie going. GISS is a much manipulated farce, bearing little , if any resemblance to reality, particularly when it comes to Arctic temperatures. If you use DMI instead, you will see that has been zero summer warming since 1958, in fact the last two years have had the shortest period above freezing in the whole of the record. This claim is plain out false. if you decide to measure the temperature over a melting ice block, you will basically always get 0°C. 2014 summer was COOLER than 1958, and had a shorter period above freezing. LOOK AT THE DATA !!! Even the SkS propaganda page, fig 1 and 2 show that that summers have not warmed in the Arctic. Thank you. And even if it might be warming a tiny amount, SO WHAT. Do you really think anyone up there is going to be complaining about having a slightly warmer winter up in the arctic ??? We are still a long way below the warm period of the most of the rest of the Holocene, barely a molehill above the coldest period in the last 10, 000 years. We are still a long way short of having just “seasonal” Arctic ice as for the first 5000 or more years of the Holocene. And another one: The law of large numbers doesn’t hold for temperatures for the same reason! Still wanna base your future decisions on the flim flam men from GISS, NYC? Slightly off topic, but can anyone explain how The Thames freezing over each year (allowing regular winter fairs to take place on it) only requires 1C lower average temps compared to today’s ? I would expect larger temp differences to be required. The Thames River was a special case during the Little Ice Age. I have adapted the following to answer your question. Hopefully it still makes sense! If global average temperatures start to cool in the next decades, we may see the start of another Little Ice Age. If so, there is a feeling that London’s Thames River may freeze completely again, like it did in the last Little Ice Age. The suggestion doesn’t consider changes made to structures on the Thames since the early 1800s. Because of the changes the river is now unlikely to freeze completely, even if there is another Little Ice Age. Before the 1800’s the river was wider and slower, and impeded by the Old London Bridge. The bridge was demolished in 1831/1832 and replaced with a new bridge with wider arches, allowing the tide to flow more freely; and the river was embanked in stages during the 19th century. All of which made the river less likely to freeze completely. Firstly, there are now power station water out-flows that will tend to increase the temperature of the Thames, at least in the vicinity of the power stations. Secondly, there are 45 locks upstream of London, each with one or more adjacent weirs. It is conceivable that the locks could be opened to *increase the flow if there was ever a risk of the river freezing. … Of course, ice is less likely to form on water that is flowing quite quickly. Biological markers show that for most of the first half of the Holocene, sea ice was a seasonal thing at best. Around 3500 years ago, the Holocene started to cool somewhat quicker, with a couple of short warmer bumps on the way down (RWP, MWP) until it reached the LIA. We are currently at the top of a third, very small bump. The Arctic, and the rest of the world is still very much in a COOL period, only just above the coldest period in the current interglacial. Actually our current rate of warming is about 30 times faster than when the last ice age was ending. So that’s a factor of 32 now compared to then. Shakun et al has been completely discredited and remains a favorite only among the climate Armageddon-worshippers who refuse hearing any non-doomsday news. Therefore you’ll have to take this quality of stuff elsewhere, as it won’t be given any space here – just so that you know and can save yourself the time of writing more of it. Readers know your blog, and know where to find it if they wish to read it. David; Shakun and Marcott are nice lapdogs for the warmunist movement, they dutifully fudged together their adjustments but all they came up with was something with a resolution of 300 years. Sure they got their funding and can evade the fate of getting a real job for a while, but please. A time series with a resolution of 300 years cannot even tell what the state today is; even if it where accurate its relevance would stop at 150 years in the past; and would be able to tell about the current state (minus any higher frequencies) in the year 2165! Please assume you have informed readers. Except for unscientific alarmists, nobody is taking Shakun seriously. What total and absolute BS !!!!!!!! The most moronic comment you have ever made…. and that is saying something,.. its a very high bar !! How TF can ZERO warming in 18+ years be 30 times the warming of anything !! David, your hutzpha is breathtaking. Despite the fact that you subtract 11,000 from 18,000 and get 8000… The temperature step change at the end of the Younger Dryas was 10°C in 200 years. That is 0.5°C/decade. Made a typo; the result is correct: 3.4 C/7000 years = 0.005 C/decade. Ed, your chutzpha is breathtaking. The Younger Dryas was a regional event. Global temperatures over the time period dropped less than 0.5 C in those 1300 years. See Shaken et al Nature 2012, Figure 2a. Except you are comparing temperature in one place — the spot on the Greenland ice sheet — to global average temperatures (HadCRUT4). These are very different data, and you simply can’t compare the variation in one spot to the global average. The standard deviations of the more local or regional data are significantly higher than the global average. You simply can’t compare the variation in one spot to the variation in the global average — they aren’t expected to be the same, and this data shows they aren’t. Stop, David, stop right there! You are about to destroy James Hansen’s Magic Teleconnection Homogenization over 2000 miles argument, making it impossible for Gavin Schmidt to continue spreading his warmunist propaganda from NYC! No no no, repeat after me: Bolivia needs no thermometer in GISS because its temperature anomaly develops the same way as the Amazons! Temperatures develop the same whether you’re on the mountains or half a continent down in a swamp! In the warmunist mockery of science, that is. Just a glance at the temperature and climate history of the past 50,000 years should be enough to make any thinking person reject the postulate of Catastrophic Man-made Global warming. Judging from the usual lengths of past interglacial periods, after some 10,000 – 11,000 years the Holocene epoch could well be drawing to its close. A climate reversion to full, encroaching, glaciation is therefore foreseeable, if not overdue, in this century, the next century, or this millennium. Looking at climate change from a century by century or on a millennial perspective and sing the same Ice core data as Ed Caryl but reducing it to century and millennial averages the overall millennial difference during the Holocene since ~8000BC has in total been a cooling of ~-1.8°C. 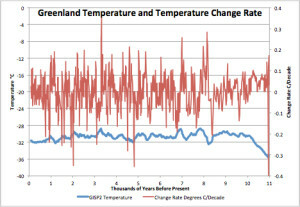 The early Holocene encompassing the “Climate Optimum” of ~ 7000BC and continuing for about 7000 years has been relatively constant with a temperature loss of only about -0.05 degC per millennium: however since 1000BC up to the present day the temperature drop was at about 10 times that rate at ~0.5degC / millennium, leaving the last millennium 1000AD – 2000AD as being the coldest of the Holocene overall. So the bulk (~80%) of the Holocene temperature loss ~-1.5°C has been in the last 3 millennia since 1000BC. So, when considering the scale of temperature changes that alarmists anticipate because of Man-made Global Warming and their view of the disastrous effects of additional Man-made Carbon Dioxide emissions, the much vaunted and much feared “fatal” tipping point of +2°C would only bring Global temperatures back to the level of the very congenial climate of “the Roman warm period”. If it were possible to reach the “potentially horrendous” level of +6°C postulated by Warmists, by the inclusion of dubious but major positive feedbacks from additional water vapor in the atmosphere, that extreme level would still only bring temperatures to about the level of the previous Eemian maximum. According to Ed Caryls figure 2 modern warming does not even bring temperatures back to those of the Medieval warm period. Looked at from the point of view of the most recent 3 millennia which have experienced accelerated cooling, a continued natural climate change towards a colder climate would now seem more, rather than less, likely. Doctors say, Global Warming is going to kill you. In fact, the slight projected temperature increase will be enough to undo all medical advances gained over the last 50 years. That would be since 1965, so I guess computer tomographs will stop working when it gets a degree warmer. Anything else? Well Ritalin as well. And Viagra. This is so ludicrous it should immediately become the new favourite argument for sod and David. I’m so glad I’m living in a cold country where all these things actually work, at least in Winter. No one is claiming Greenland represents the global temperature. I think Ed is only saying that the GISP record shows that the current changes are no different from past changes. The record shows nothing unusual is happening today. Thanks, added as an UPDATE. You can’t compare regional fluctuations to global fluctuations — the former are always going to be larger than the latter. In fact, the global temperature could be constant and you’d still have regional fluctuations. If you must insist on splicing 20th Century temperature measurements onto Greenland proxies, whether from ice cores or elsewhere, please use local and/or regional Greenland temperature msmts, not efforts at calculating global mean surface temperatures. In this aspect Appell is right. OT. Yesterday the Court in The Hague has obliged the Dutch government to reduce GHG’s more than planned. The case was initiated by an activist group Urgenda. The verdict is considered historic as for the first time a Judge interferes with Dutch politics. The Judge considered climate change proven by science and convicted the State to protect its citizens against harm. OK guys. The GISP2 ice core temperatures are the best record we have. There is no other. No, it isn’t global. It is a record of temperatures at Greenland’s latitude, which covers a good part of the globe that the current global temperature records are based on. The people that did the GISP work intended their readings to represent global climate. We have no Greenland thermometer readings that cover the years back to 1850 allowing a splice. Godthab-Nuuk goes back to 1880 and has problems with gaps, moves, and infrastructure changes, as well as UHI effects. But I can see why the calamitoligists want me to use it. 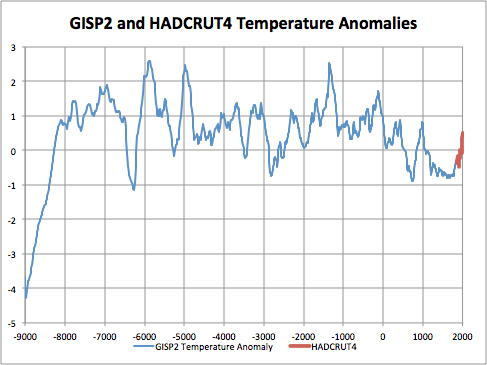 I used HADCRUT4 because it likely has the least amount of Mann and Hansen-made warming in it. I repeat, the current warming is not unusual. Even splicing on the most biased temperature record anyone can find will not change that fact. Ed, can you compute from the Excel sheet, for the differentials shown in Fig. 1, number, mean, standard deviation, and skewness? I would like to know whether the Greenland differential 1975-81 is more than six standard deviations above the mean. I’m working on the Greenland GISS data right now. There are some surprises in it. I chose the GISS data, because i knew that via the maps i could easily access latitude data. your points about the ice core data have been made before and have been answered before. Things just are not that simple, as looking at the ice core graph and drawing conclusions about the last 40 years. Even IF you find stronger warming/cooling you will have to check other factors, like volcanoes, before you draw any conclusions! That article puts in a +2°C offset between the ice core data and the surface temperature! What’s up with that? Without the offset their whole argument goes away! …got any CREDIBLE source instead? That’s the problem, the sod thinks Sks is actually credible.. rather than a low end cartoonist’s joke!! It is really difficult to take anyone who is unable to distinguish between activists sites and regular ones seriously. Oh.. you mean like the West Antarctic Peninsular, the only part of the Antarctic that shows any melting or mass loss. No it does not do that. 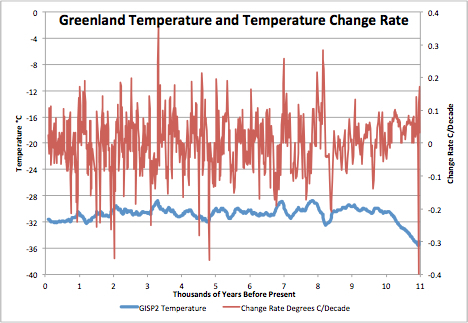 the original data (and your first graph) are not anomalies, but real temperature data. so the “offset” is just showing, that the two numbers are not directly comparable. you are using an “offset” (of -2°C), when you splice the thermometer data to the ice core graph. But the all of that is explained in the article. please read it! so even moderate variations of your approch change the graph in a rather strong way. That today looks really like a cold phase in your graph is an artifact with little connection to reality. SkS, the most unreliable, NON-scientific site on the web. The fact that you continue to quote it says so much about your intelligence. !! we are discussing facts here, not opinion. who did add an offset to the data, SkS or Ed? “we are discussing facts here, not opinion. sod I read the drivel at the cartoonist site. I think they try to show that two temperature reconstructions 28 km apart show wildly different temperature histories. I think that torpedos James Hansen’s 2000 miles-teleconnection homogenization radius technique. Are you sure the little treehouse club of horrors is actually helpful for your warmunist goals? Sks is a joke.. and not a very good one. That is a consensus agreement. I thought you were all for the consensus. I am sort of shocked by the weakness of the arguments in this comment section. there is basically nothing beyond “SkS is a bad source” or jokes about interconnection. Where are your real arguments? I disagree with the points made by Ed Caryl in the original post. BUT: he is making a serious argument and he is making an effort to make a coherent reply to counter arguments. I even think that most of the points he makes have some value (for example you can splice data and you can use an offset to do so), though i think the combination of them leads to a false conclusion. Do you really have no argument? please read the article, your interpretation is completely false. Its all right, we are used to your comments by now. We have low expectations of them. I tried to, sod, I see he mostly agrees with Easterbrook (as he clearly states) but claims 28 km away there’s a completely different situation. That’s the entirety of sense I can get from the rather incoherent writeup. Maybe your superbrain has distilled a meaning that entirely escaped me? You know, I read stuff sentence by sentence. Maybe that’s too unprogressive. Also, please defend Hansen’s magical universal teleconnection with a sound argument. If that’s not too unprogressive a demand. …I think the incoherence of the SkS writeup is caused by their habit of constantly rewriting both their articles as well as their comment threads. But it looks like they have given up on publishing a comment thread altogether. Well it’s a real problem to keep a text comprehensible when you’re forced to constantly rewrite it, I give’em that. It doesn’t help when your conclusion is predetermined and needs to appear as if it has been reached by a process of sound reasoning when such a process hasn’t actually happened. No, it doesn’t — it covers the part of the globe where the ice core was drilled. They certainly did not. Read “The Ice Chronicles” by Mayewski and White, or “The Two-Mile Time Machine” by Richard Alley. They knew what the ice cores were showing.